These chaps like their tea how they like their women. Hot, and with milk and sugar. 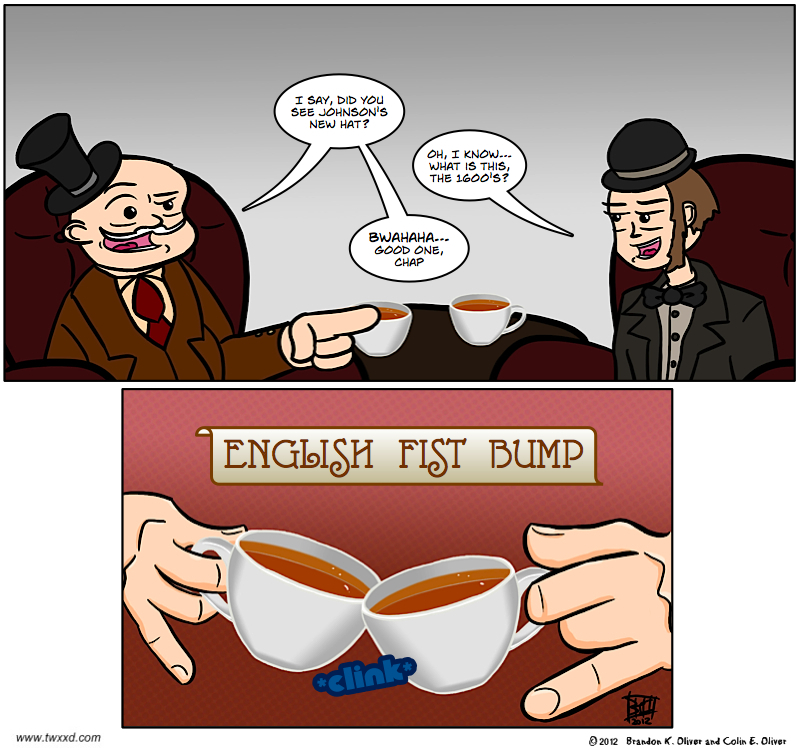 Apparently, in England, a fist bump is also called a “Spud”. I love Wikipedia. I prefer my “tea” hot and wet. Americans traditionally enjoy their “tea” by throwing it in droves into harbors. We’re such romantics. Sounds like a delicious swim to me. I like their style, quite unfortunate it is uncommon now. Sometimes you’ve got to bring classy back. I’ve been thinking about getting a monocle. Ha ha ha, what, what and all that! Chip, chip, cheery ho, yo. Wait how did you kn…err…yes, it’s like that. I’m suing you for all of your Optimus Prime figures and variants. Also two Megatrons and 8 Grimlocks. Lol, our “Gentlemanly” infringement won’t go unpunished, eh? What if I say, offer you some poutine and beer? It’s funny, I think there are exactly 8 Grimlocks that I own. Now I need to go home and count. You have now paid me off. My attorneys will stay put for now. He he, that is a different “gentleman’s gesture”. Top drawer, old bean, top drawer! Nice one! Good looking cups of tea! Little known fact…they normally had actual potatoes on their fists at the time. Fist pumping like a sir!